Brisbane ~ Life after Thirty..
Linda is Zenas old boss from when she worked in Southampton. Kiwi by birth, with Irish parents, and now living in Brisbane, Australia. Gary is her husband, working as the head of a Business Analyst unit. These two love travelling, and Zee had arranged for us to stay with them for the weekend. And what a weekend! They showed us the sights of Brisbane and looked after us really well, with some wonderful meals, and some of the most amazing hospitality shown to us ever!! Started the weekend by taking us to this Mountain that overlooks Brisbane, and then back home. They have a great apartment on one of the ridgelines in Brizzie, that itself has the best views. There flat is stunning. Pretty much a smarthouse, with switches to turn lights on in different areas. Gary loves his movies and music, so has this brilliant home theatre. Gary also loves to cook, and made us all a wonderful meal on Saturday night. Sunday saw us getting up early for a nice walk to get our appetites up. We got the Brisbane CityCat down to South bank. South Bank used to be industry and wasteland, until the city bought it for the venue for 1988 World Expo. Since then it has been turned into Parks, climbing and Beaches. It also has superb Arts centres. We walked all along here to the main city itself. We then headed for some Breakfast. We finished the day by heading back to Linda and Garys place, to see Brisbane at night-time. Very impressive..
Now we are in Byron Bay for the next few days, staying at the Arts Factory Hostel in a tent next to a lake (read: Swamp) .. I will let you know what the Mossie bites are like in a few days! 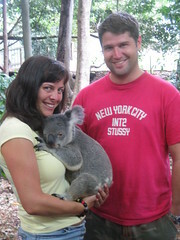 that photo is soooo cute....i hope u stole me a koala too!!!!! u know what u should get tho...a bunny rabbit...and house train it!!!!! then u'll have bunny, a cat and a koala!!! how cool would that be!!! that photo is totally lush tho!!! i'm so jealous!!! I'm so proud that i won the 100 comment competition! YAY!! !